Exploring the world of contemporary jazz saxophone. Personnel: Jim Snidero: alto saxophone; Paul Bollenback: guitar; Linda Oh: bass; Rudy Royston: drums. 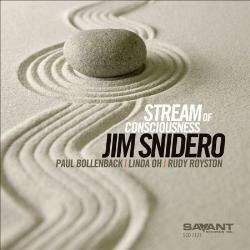 Stream of Consciousness starts with the title tune, a simple, upper mid-tempo, modal composition along the lines of “Impressions.” Snidero takes the first solo, displaying a dry, airy tone, somewhat along the lines of David Binney, though his phrasing is more traditional and straightforward. Snidero plays his solo with only bass and drums for accompaniment, employing bursts of clipped and horizontal phrases, following the chord changes faithfully. Bollenback comes back in for his solo, which is very good, a nice mix of fleet lines and chords. Royston finishes the solos with one that is intense but melodic. “Fear One” is an up-tempo tune on which Oh lays out. Snidero plays a skillful solo, one fast line after another, but one that doesn’t have much development. Royston gets in a good solo, rumbling all over the drum set. The tune is a bit unsubstantial, unfortunately, and doesn’t give the musicians much to work with; they probably should have included the bass to give the cut some gravity and more drive. “Vantage” has a slow, drawn-out, meter-less start and eventually develops a slow, bluesy groove. Snidero plays a brief solo, alternating fast lines with slower, swinging phrases, and Bollenback plays a fine, bluesy, distorted electric guitar solo, adding some welcome emotion to the proceedings. “Black Ice” is a fun, mid-tempo tune with a slightly funky groove, with Snidero and Bollenback in unison on the funky melody. Snidero plays a light-hearted, disjointed solo. Bollenback plays a clever, reverb-y solo that is too brief. Oh adds a lyrical, horn-like bass solo. “Wisdom’s Path” is a lower mid-tempo jazz waltz (which reminds me a bit of Gerry Mulligan’s “Walk on the Water,” on Mulligan’s wonderful big-band recording of the same name.) Snidero seems to favor pretty jazz waltzes; “Beatrice” on Storm Rising and “Twilight Waltz” on Standards Plus come to mind. Bollenback is on classical guitar again, and plays a shimmering, Spanish-tinged solo, Royston providing cool, swinging support behind him. Snidero seems more relaxed and engaged in his solo on this cut, showing off his textbook jazz articulation. Oh plays a fine solo, too. “K-Town” is another modal tune, with a dissonant melody taken at mid-tempo, again sounding a bit like “Impressions.” Snidero improvises well, with a bit more fire and edge than usual, but the unvarying rhythm of the cut gets monotonous; the tune could have really used a bridge. Bollenback has lots of interesting things going on in his solo; he accomplishes a lot in a small space of time. Near the end of the cut, Snidero lets loose a bit, with some wilder playing and altissimo screaming; I wish he had employed a bit more of this emotion in some of his other solos to add some spice. I have mixed feelings about Snidero’s work on this recording; while he has a good sound, good ideas, and beautiful jazz articulation, his solos don’t have much development and come off as a bit cold. The tunes on this recording are a bit lackluster, as well. The star of the show is Bollenback, whose solos, on both electric and acoustic guitars, consistently display logical development, clever ideas, and emotional engagement. Overall, Snidero displays solid and accomplished alto sax playing on Stream of Consciousness, but, in my view, he could have used something to fire up his somewhat emotionally detached improvising. If someone can't tell the difference between something as simple as 3/4 and 4/4 meter ("Beatrice" is not a waltz, it's in 4/4) they obviously don't have a clue. Yikes, of course, Jim is right; Beatrice is not a waltz; straight 4/4. Hopefully, lots of other listeners will pick up Stream of Consciousness to check on other evidence of the blog poster's cluelessness. Professional librarian. Amateur saxophonist. Full-time jazz lover.